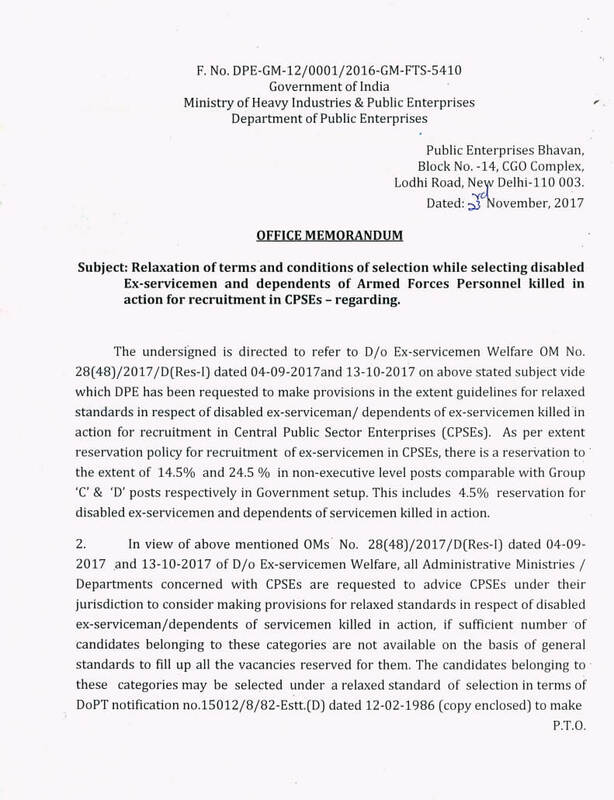 Subject: Relaxation of terms and conditions of selection while selecting disabled Ex-servicemen and dependents of Armed Forces Personnel killed in action for recruitment in CPSEs - regarding. The undersigned is directed to refer to D/o Ex-servicemen Welfare OM No. 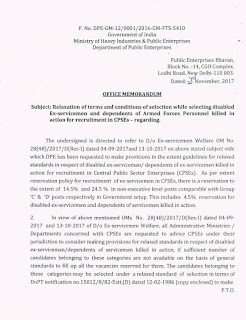 28(48)/2017/D(Res-I) dated 04-09-2017 and 13-10-2017 on above stated subject vide which DPE has been requested to make provisions in the extent guidelines for relaxed standards in respect of disabled ex-serviceman/ dependents of ex-servicemen killed in action for recruitment in Central Public Sector Enterprises (CPSEs). As per extent reservation policy for recruitment of ex-servicemen in CPSEs, there is a reservation to the extent of 14.5% and 24.5.% in non-executive level posts comparable with Group ‘C’ & ‘D' posts respectively in Government setup. This includes 4.5% reservation for disabled ex-servicemen and dependents of servicemen killed in action. 2. In view of above mentioned OMs No. 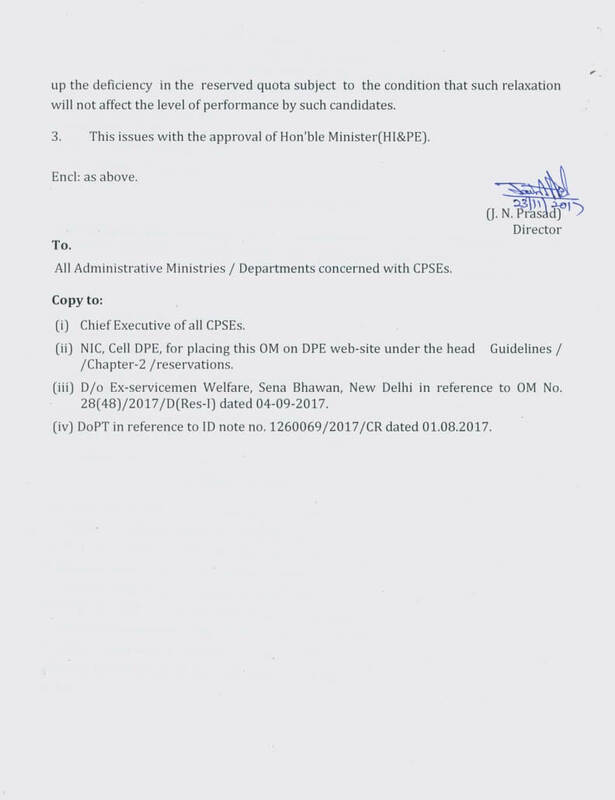 28(48)/2017/D(Res-I) dated 04-09-2017 and 13-10-2017 of D/o Ex-servicemen Welfare, all Administrative Ministries Departments concerned with CPSEs are requested to advice CPSEs under their jurisdiction to consider making provisions for relaxed standards in respect of disabled ex-serviceman/dependents of servicemen killed in action, if sufficient number "of candidates belonging to these categories are not available on the basis of general standards to fill up all the vacancies reserved for them. The candidates belonging to these categories may be selected under a relaxed standard of selection in terms of DoPT notification no.15012/8/82-Estt. 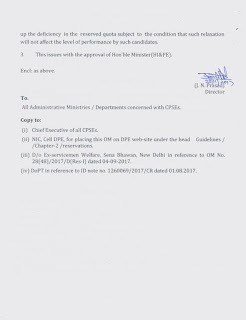 (D) dated 12-02-1986 (copy enclosed) to make up the deficiency in the reserved quota subject to the condition that such relaxation will not affect the level of performance by such candidates. 3. This issues with the approval of Hon’ble Minister(HI&PE).